Apricots, plums, apples, cherries, and pears all need bees to pollinate their flowers. Traditionally, we’ve used the European honey bee, but now we know how to pollinate our fruit trees using a steely blue native bee, the blue orchard bee (Osmia lignaria). These wild bees fly nationwide. 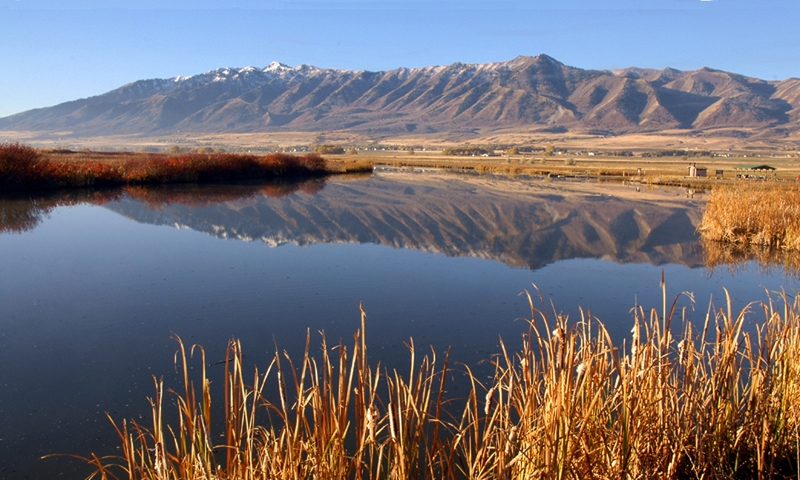 In Utah, they live in foothill and lower montane habitats. Blue orchard bees are not social; every female is fertile and tends to her own tiny nest. Adults are the size of a chunky honeybee and are active for only 3-4 weeks in the spring. 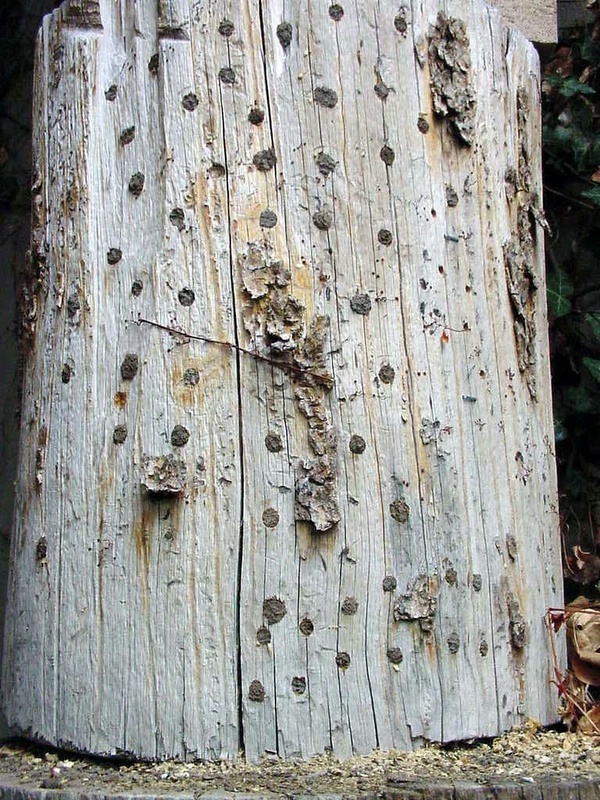 These bees naturally nest in the tunnels chewed by large wood-boring beetles in tree trunks. Each female partitions her tunnel into a series of tiny bee-sized rooms. Each room is stocked with a pea-sized provision of pollen moistened with nectar, followed by a single egg. Nest cells are partitioned, and ultimately capped, with mud, hence their other common name: “mason bees”. You can have your own backyard population of blue orchard bees. An easy way to begin uses a short fat log that is seasoned and dry. Take a 5/16 bit and drill 20 or more holes radially 5 to 6 inches deep. Stand the log on end, facing the holes towards the southeast. On cold mornings, nesting females bask in the sun before taking flight. If bees colonize your log, you will see the steely blue females busily coming and going all day long during fruit tree bloom. They tote their loads of dry yellow pollen in a brush of hair beneath the abdomen. Unloading that pollen at the nest requires some charming acrobatics that are well worth watching. While collecting pollen, female blue orchard bees pollinate your trees with hundreds of fruits resulting from each bee’s lifetime of work. Successive generations will nest for you every spring, but you’ll want to switch to replaceable nesting materials to prevent the accumulation of pathogens and parasites. 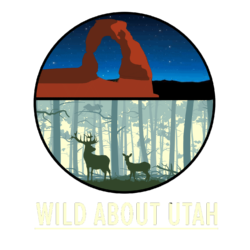 Details and links can be found at our Wild About Utah website. Do you grow the ornamental plants called “lamb’s ears” or rose campion in your flower gardens? These plants produce dense mats of buttery soft woolly leaves. That leaf fuzz is avidly sought by so-called “carder bees” of the genus Anthidium. In textiles, carding is the mechanical process of combing through the fibers of cotton or wool to align them before spinning. The female carder bee has multi-toothed mandibles that she uses to shave the leaf hairs, gathering the fluff into a ball to bring back to her nest. Carder bees nest solitarily in aboveground cavities, typically an old beetle burrow in deadwood. Each female lines her tunnel with the carded plant hairs. Onto this fluffy pillow she assembles a provision of pollen mixed with nectar, which constitutes the food mass soon to be eaten by her progeny, one provision per larva. Carder bees are stout, round, relatively hairless bees marked in black and yellow. 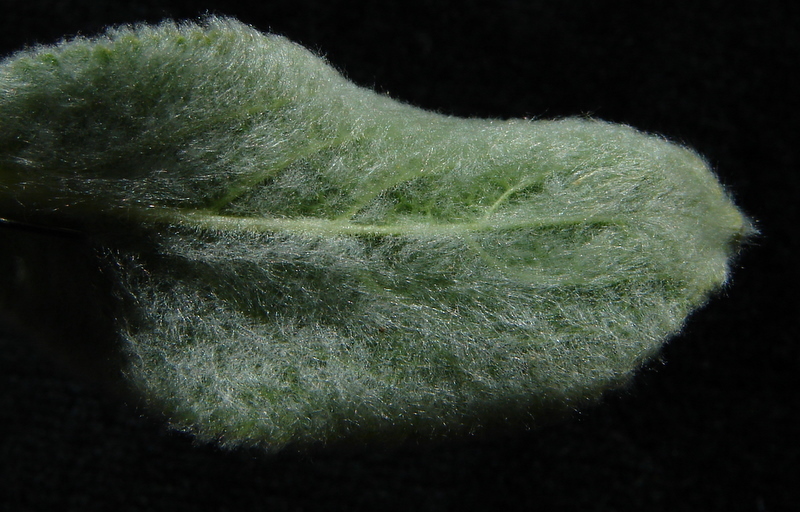 We have several species, the largest being a European escapee that is associated with lamb’s ears. The female’s nesting biology is distinctive enough, but it is the male’s behavior that you will notice first. Male carder bees are aggressive, territorial suitors. They spend all day in flight, tirelessly patrolling lamb’s ears and garden flowers, particularly culinary sage and Russian sage. 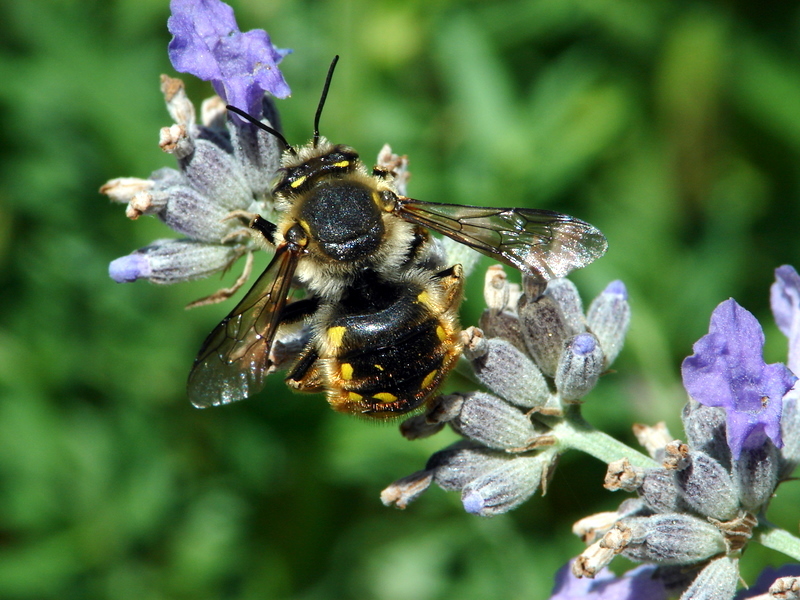 Males dart at all carder bees of either gender, as well as other like-sized bees. They pounce upon and wrestle these unsuspecting individuals to the ground. If it is a female of their species, they will endeavor to mate with her. Such is the brazen courtship of male carder bees. Look now for these wool gathering bees in your gardens before summer bids us farewell. Three years ago, the United States Senate unanimously designated National Pollinator Week. This year it falls from June 21 to 27. Pollination is vitally important for many domesticated and wild plants. By far the most important pollinators are bees and Utah is home to 900 species. Bees pollinate food crops such as apples, cherries, apricots, squashes, raspberries and cucumbers. Bees are also essential to pollinate most wildflowers in our native plant communities. Happily, few of our native bees have much venom or any inclination to sting; in part because they are solitary nesters. In contrast, honeybees and bumblebees are social and in defense of home will deliver memorable stings. All bees visit flowers to sup nectar for energy. Females also collect protein-rich pollen to feed their offspring. 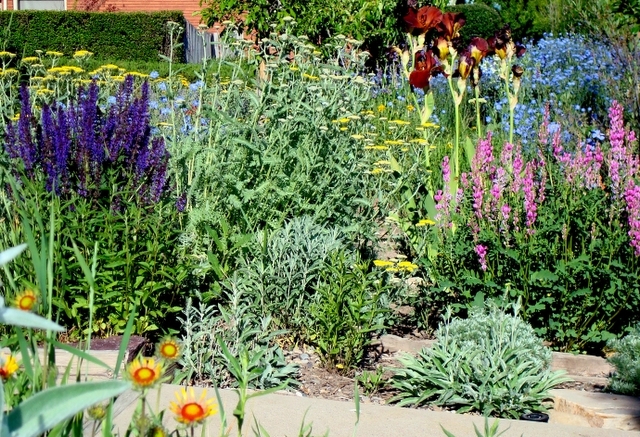 Grain and hay fields, pavement and buildings have all displaced native plant communities, but our flower gardens can become valuable cafeterias for local bee populations. Because bees find their favorite flowers by their color or scent, a bee garden can also appeal to people. Different bees prefer different kinds of flowers. Many bees are attracted to members of the pea family, such as vetches, clovers and locoweeds. 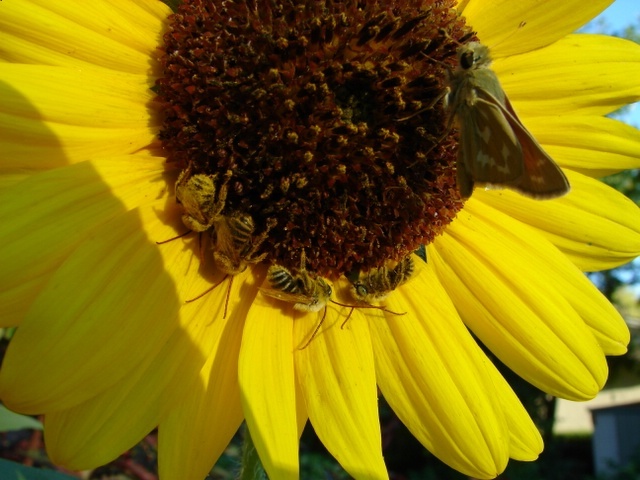 Bees appreciate sunflowers and their kin as well as lavender and many other herbs. On the other hand, some plants have been so altered by plant breeders that they no longer feed bees. Examples include doubled flowers like marigolds, flowers with ruffles like petunias and some other common bedding plants. 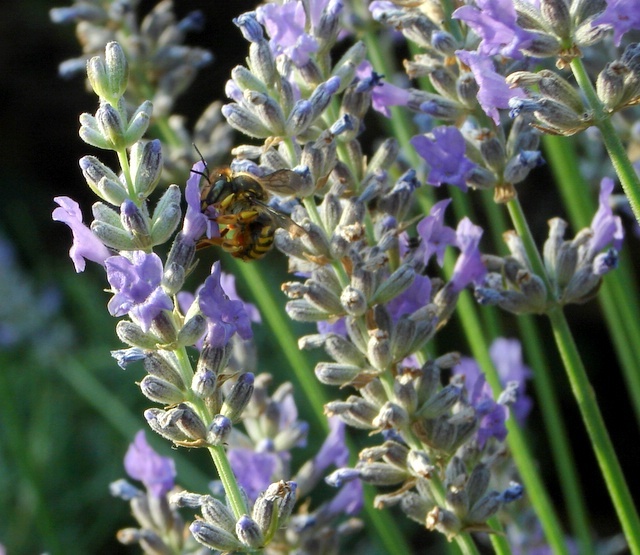 Please consider our important pollinators when you are choosing what to plant in your garden. You will be rewarded by increased fruit and vegetable yields while surrounded by beautiful blooms. It’s early spring, the time of fruit tree bloom. Apricots, apples, plums, cherries, and pears will all need bees to pollinate their flowers. 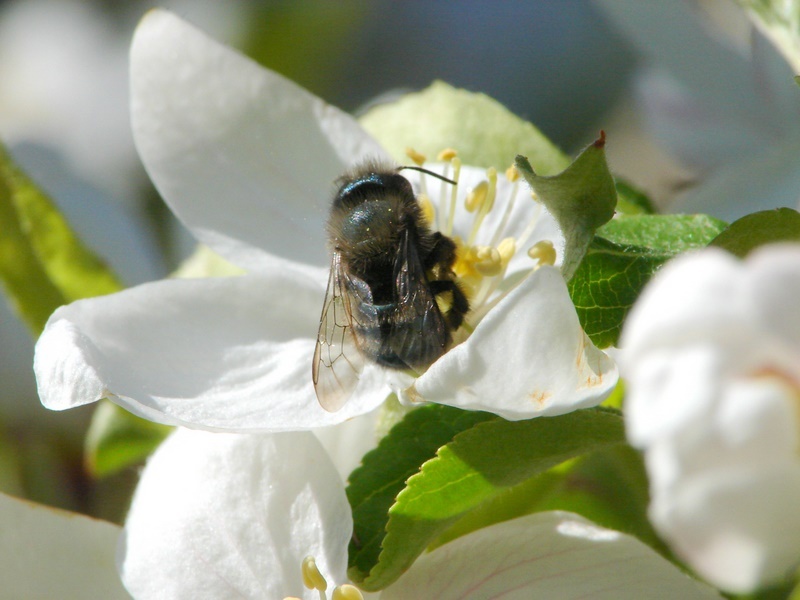 Traditionally, we’ve used the European honey bee, but now we know how to pollinate our fruit trees using one of our native bees, the blue orchard bee (Osmia lignaria). These bees fly nationwide. In Utah they occupy many foothill and lower montane habitats. They aren’t social; every female is fertile and tends to her own tiny nest. Adults are active and nesting for only 3-4 weeks in the spring. 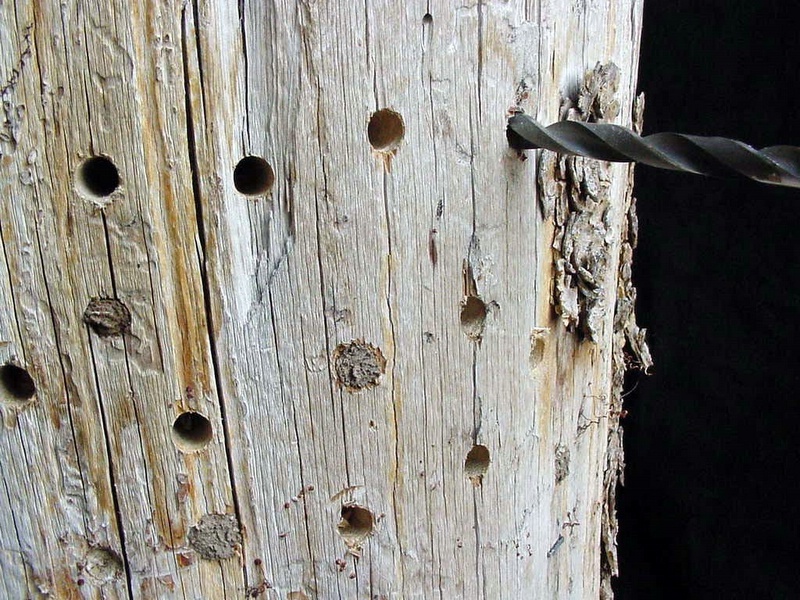 These bees naturally nest in the tunnels chewed by large wood-boring beetles in tree trunks. Each female partitions the tunnel into a series of little bee-sized rooms. Each room is stocked with a bee-sized provision of pollen moistened with nectar, followed by a single egg. Nest cells are partitioned, and ultimately capped, with mud, a trait shared with other so-called “mason bees”. You can have your own backyard population of blue orchard bees. One easy way to start is with a short fat log that is seasoned and dry. Take a 5/16 bit and drill 20 or more holes 5 to 6 inches deep. Stand the log on end, facing the holes towards the southeast. On cold mornings, females bask in the sun before taking flight. If your log is colonized, then you’ll see steely blue bees busily coming and going all day long during fruit tree bloom. They tote their loads of dry yellow pollen in a brush of hair beneath the abdomen. Unloading that pollen at the nest necessitates some charming acrobatics, part of their undeniable entertainment value. Successive generations will nest for you every spring, but you’ll want to switch to better nesting materials to practice good bee hygiene.